Day 4 of CMJ might have been the best yet. Actually, scratch might. I headed over to the Bowery Ballroom down on a Delancey Street in Manhattan (everytime I say "Delancey", I feel like I'm in Newsies or something), a sister venue to one of my faves -- Music Hall of Williamsburg -- and it shows as its internal set up is almost identical, albeit the performance space itself is quite a bit smaller. The space has immediately become one of my favorite live venues, mostly for its small space, no barricade to the stage (more on that in a sec), and balcony/behind the soundboard option. I was there for the CAA Showcase to see pop artist Frankie. While the showcase got started a little late leading to every act being pushed back a half hour (you can't win 'em all, I guess), the showcase began with rapper Ingrid Burley who's set flew by and felt far too short for how talented she is. Her rhymes were slung like poetry. Check her out on SoundCloud, in particular the song "I Told You Once". Following Ingrid was Jahkoy, an electronic-swizzle R&B/rapper who's catalog would fit alongside nicely with Jason DeRulo or Ne-Yo. He kept the crowd moving and won a lot of people over, myself included. Super catchy "Let It Be" prompted a whole crowd singalong. Then came adorbs Ms. Frankie flanked by her also adorbs band (drumkit, keys, and a guitarist who also doubled as a tambourine-ist and a cowbell-ist). The CMJ festival was Frankie's first time playing NYC but you wouldn't know it from how in her element both she and her band were. The crowd seriously filled in during her set and kept singing along by the second chorus to almost every song in her set. I adore her single "New Obsession" so obviously that stood out to me as a highlight but so was the more emotional "Problems Problems", super high-energy "Blackout" (accented by exaggerated tambourine slams), "Chaos" (Frankie stood on stage alone and played the song just with the guitar), and a new, not-yet-released jam called "Sweet Talk". Frankie is signed to RCA and I highly recommend checking out her stacked debut EP, Dreamstate, released back in August. After Frankie, Joe Jonas' DNCE came to the stage. I know what you're thinking -- Mel, you saw a Jonas two nights in a row? How typically basic of you. This was clearly planned, right? Nope. Like, I said, I was there for Frankie -- and front row no less -- and sometimes magic just happens. Such is life (and CMJ). The real thanks goes out to DNCE's booker/publicist. As the kids say, you the real MVP. DNCE kept to their same set as when I saw them at Webster (including the Drake cover) but what made the second time more special was: 1) I was familiar with the songs, 2) the stage was much smaller, 3) the crowd was less unruly/pushy, 4) I was smack dab right up in front, against the stage itself. 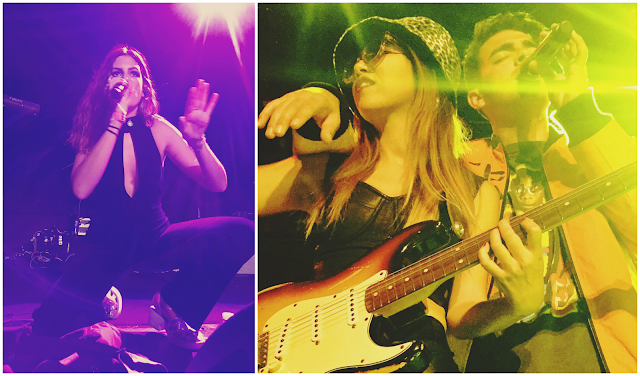 Standing right in between the homebase position of the girl-crush guitarist JinJoo Lee and Joe himself. With excited Jonas fangirls on either side of me. Me. Element. Matched. Check. I've said it once, I'll say it again -- Joe is a bundle of energy, always has been, and his "new" cohorts in DNCE blend well with this as they are all bundles of energy themselves. Bassist Cole Whittle in particular. Lordy. While at Webster, Joe jumped off the stage to crowd surf, he didn't take the chance at Bowery and rather just jumped down into the crowd -- directly to my left, might I add -- and waded out into the sea of people. Thanks, Joe. Don't ever change. Any hoot, it's worth nothing that despite being as close to the stage as humanly possible (seriously, if I had the upper body strength, I could have jumped right up there), the sound quality was still awesome and didn't blow my ears out like I (read: I'm not a regular Mom, a cool Mom -- reference!) was initially fearing. Whether its a credit to the sound crew or the venue itself, not sure, but kudos. BONUS PS: Apparently the Bowery Ballroom show was a reunion for the Jonas Brothers sans the music. Nick & Kevin were both there (sorry, I didn't see them) as was Joe's girlfriend, model Gigi Hadid. One more day left...As always, photos and gifs are available to for use as desired with credit to www.MelismaticBlog.com!